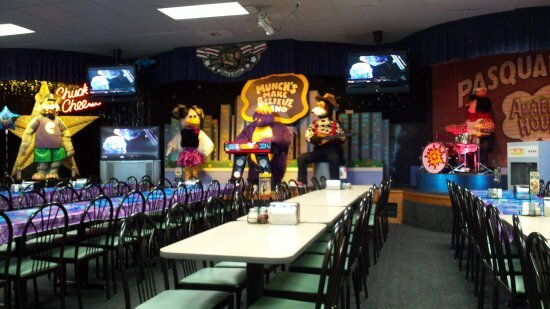 The recent news out of CEC Entertainment, the company that operates the Chuck E. Cheese’s chain of restaurants, was that they were redesigning their restaurants to include the elimination of the animatronic band. The new concept certainly looks lovely, as they give the dated Chuck E. Cheese theme a modern appearance. However, I have mixed feelings about the elimination of the animatronics. First, for those of you who aren’t familiar, here is a brief history of the concept: Chuck E. Cheese was introduced as the mascot of Pizza Time Theatre in 1977, a company founded by Atari founder Nolan Bushnell, which was a pizzeria and arcade with an animatronic show. Then entrepreneur Bob Brock founded ShowBiz Pizza Place in 1980, which was the same basic concept, but outsourced the show to Aaron Fechter‘s Creative Engineering. 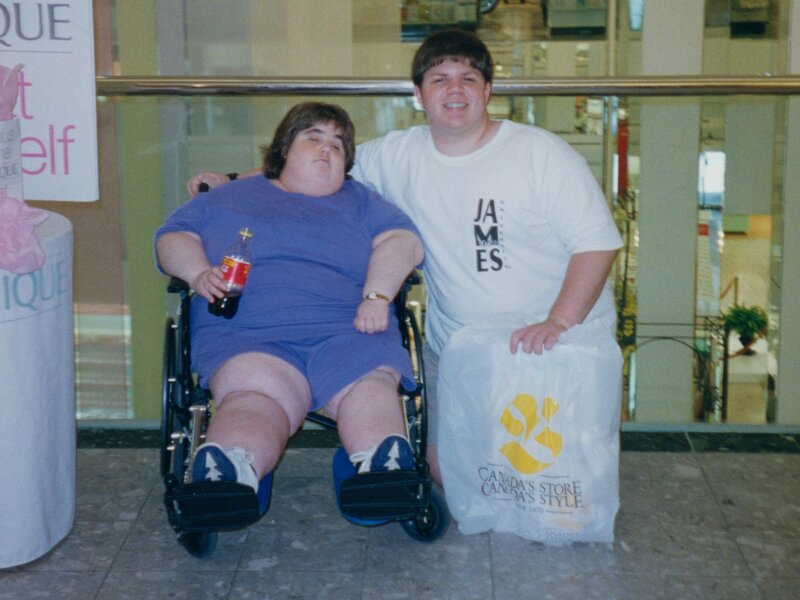 The two were in competition with each other until Pizza Time Theatre declared bankruptcy, and ShowBiz bought them out. They ran the two brands in parallel for a while, but considering that the ShowBiz show and characters were outsourced, while the Chuck E. Cheese characters were owned outright, that came to its logical conclusion in the early 1990s, where all of the ShowBiz restaurants were converted to the Chuck E. Cheese theme and show. Then in the late 1990s, they started doing stages with only one animatronic rather than five. Then in the early part of this decade, they began opening restaurants with no animatronics at all, leaving the stage empty so that an employee in a rat suit could dance around. I’ll be the first to tell you that I loved going to ShowBiz, in part because I loved seeing the animatronic band, The Rock-afire Explosion, perform. 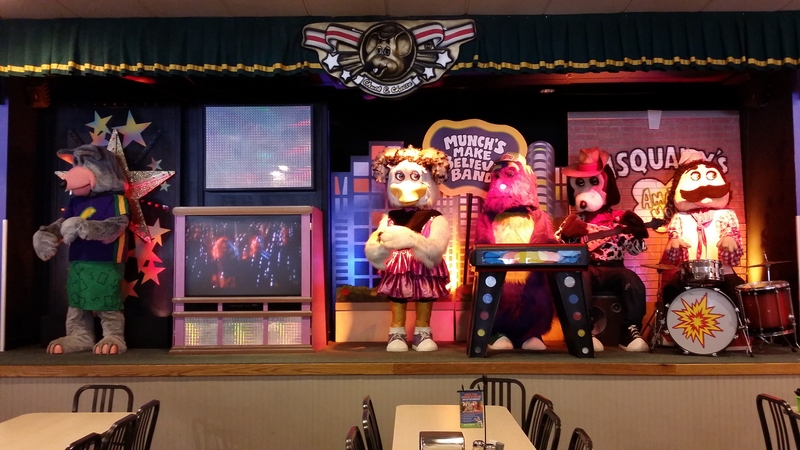 I was extremely disappointed when I went into ShowBiz and found my Rock-afire characters gone, having been replaced by a new show called “Munch’s Make Believe Band”. As soon as I saw it, I remember thinking, The Rock-afire Explosion was a real band, not a pretend one. I’m pretty sure that we only went to ShowBiz one or two more times after this. It wasn’t the restaurant that I knew and loved anymore without the Rock-afire. That was a quality show that was enjoyable for any age. I enjoyed those shows as a child, and I also enjoyed watching them when I found a bunch of the shows online a few years ago. Then in the 1990s, they changed Chuck E. Cheese’s voice, going from something that sounded like a mouse from New Jersey ought to sound like, and replaced it with a high, goofy voice. Thus they began to dumb down the show for the kids. That’s where you start to lose people, I believe. As I understand it, the animatronic show was intended less for the kids and more for the parents, i.e. you’re giving the parents something to watch while the kids run around pumping tokens into the arcade machines. After all, the kids don’t have jobs. The adults are the one paying for it. Thus the idea is to aim high – keep the adults entertained, while keeping the show accessible for children. Don’t be afraid to let a few references or jokes sail right over the kids’ heads. They’ll figure it out eventually, and then when they find stuff from their childhood on the Internet years later, they’ll be able to say, “Ah, now I get it!” If you’re aiming at the kids and talking down to them, you’re going to make it pretty insufferable for the adults. Note big introduction of Chuck E. Cheese, and then they immediately started singing “If You’re Happy and You Know It“. Full disclosure: I hate that song. With a passion. I always did, even as a child, because it’s just that obnoxious of a song. The hell with you – I’m not happy and I know that I’m not happy specifically because you’re making me participate in this monstrosity of a song. And they didn’t even bother to provide any context for the song to the audience. They’re singing it like they mean it, and it’s aimed squarely at the kids, talking down to them. If I were a parent there when they put this show on, I think that’s when I would be extremely grateful that they serve beer at Chuck E. Cheese’s. It doesn’t matter that it’s pisswater beer. I don’t think I could stand having to be around that stuff sober. I don’t even drink anymore, and that would drive me right to it. Gimme a brewski, and keep ’em coming. Then in my most recent visits to the establishment, the animatronics have clearly taken a back seat. When Elyse and I dipped into a location fitted with older Cyberamic animatronics, they barely used them. Most of the entertainment was on the television monitors, which doesn’t do anything for me. I can watch cartoons anywhere, after all, and their cartoons aren’t very good, again because they’re talking down to children. Most of what the animatronics did was just move their heads around randomly. They didn’t perform much at all. No wonder they are opting to dispense with the animatronics – they’re barely using them in the first place. I also find the idea of the animatronics’ being outdated as a reason to phase them out to be a bit disingenuous. Yes, the animatronics at many of their locations are more than 30 years old. That’s because they failed to invest in their shows, and didn’t upgrade the bots to keep the show new and fresh. The last major upgrade that many of the shows received was in the early 1990s, when the stages were reconfigured to the Munch’s Make Believe Band design. That was more than 25 years ago. It’s stale, and it’s because they didn’t bother to keep it updated it over the years like they should have. Additionally, over the years, they have cut these older shows back, as the former ShowBiz stages that were converted had a “Junior Munch” character on center stage in the front, a building and moon animatronic in the background of center stage, and a camera animatronic on stage left. Most if not all of those pieces are now either removed or otherwise no longer in use, making the show just a little less interesting. That animatronic was a tremendous upgrade from the Mitzi that was in ShowBiz restaurants at that time, which could only tilt at the hip and move the arms up and down. Unfortunately, though, I don’t believe that this animatronic ever made it to an actual restaurant. This has way more movement than the original version of the show that you saw at ShowBiz Pizza Place. My only complaints about the newer show have nothing to do with the animation, but rather about the arrangement of the characters, and the complete lack of Rolfe and Earl. Imagine what it might look like if development had continued to the present day. Bottom line is that it is possible to keep things fresh and interesting with the proper investment, which CEC Entertainment failed to do. Of course, in an alternative future where they had kept the Rock-afire characters and converted all of the Chuck E. Cheese locations to ShowBiz Pizza Place instead of the other way around and ditching the Chuck E. Cheese characters, I imagine that The Rock-afire Explosion would have eventually been bastardized and cheapened just like they did with their in-house show. Imagine the “Studio C” concept with Billy Bob, and all of the Rock-afire characters as puppets. No. Just no. The characters seem stiffer, and move less, which makes suspension of disbelief a lot harder. And these are the good animatronics, too, and not the swiveling Cyberamic characters. So all in all, if CEC Entertainment is unwilling to properly invest in a show, then I’m fine with their doing away with the animatronics once and for all. The animatronic shows, which were what set them apart from everyone else, are only an outdated concept because they let their shows become outdated. Live shows just don’t capture the fun of the animatronic show. After all, if I want a restaurant with an arcade, I can go to Dave & Buster’s, and truth be told, I do go over there every few months. The food is better there, too. Without the show, Chuck E. Cheese will not be missed.